What’s it about? The film centres on Eva (Louis-Dreyfus), a divorced masseuse whose daughter Ellen (Tracey Fairaway) is about to leave for college. 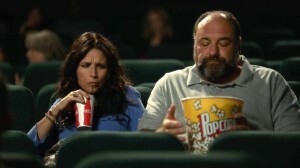 Albert (Gandolfini) is facing the exact same situation, and after the two meet at a party, they begin a relationship. At the same shindig, Eva meets Marianne (Catherine Keener), who becomes both a client and new friend. When Eva discovers Albert is in fact Marianne’s ex-husband (whom she constantly complains about) she begins to doubt her new relationship as Albert’s imperfections become glaringly clear. Verdict: Although the initial set-up is laden with coincidences, Enough Said is brimming with authenticity. It’s a delight to watch the relationship between Eva and Albert blossom; and just as they fall in love with one another, the audience fall in love with them. Indeed, they may be the easiest on-screen couple to root for this year. Key to that rootability is the couple’s natural sense of humour, much of which is extracted from awkward situations (Eva has no filter) and is frequently laugh-out-loud funny. That oft-hilarious wit is a testament to Holofcener’s excellent dialogue, and the sharply-observed script not only gives a knowing examination of the give-and-take that comes with being in a relationship, but also how to make a romance truly thrive. The message of getting comfortable with your partner’s habits and lifestyle, for instance, is one that feels real and relatable. It doesn’t hurt that the chemistry between Louis-Dreyfus and Gandolfini is palpable, with both TV veterans displaying deft comedic timing. Gandolfini’s Albert is a particularly likeable character, and The Sopranos star plays him with magnetic warmth. Additionally, there is also strong support from Keener, Fairaway, Toni Collette, Ben Falcone, Eve Hewson and Tavi Gevinson, whose characters are far from the superfluous personalities they so easily could have been. Final Words: Funny and heart-warming with two brilliant performances, Enough Said is an all-too-rare rom-com treat. Watch at your earliest convenience. One comment for "Enough Said Review"